Cargo Screening K9 Alliance (CSK9) has become the first company to certify under the TSA’s Third-Party Canine-Cargo Programme (3PK9-C) initiative. The TSA’s 3PK9-C initiative was launched to enable TSA-approved, third-party certifying organisations (TPCCOs) to certify canine teams to screen air cargo according to TSA-approved standards . As of October 26, Cargo Screening K9 Alliance (CSK9), became the first organisation to certify under the 3PK9-C programme, with dog handler Ashley Beardand and her canine, Colt, becoming the first dog team to certify. 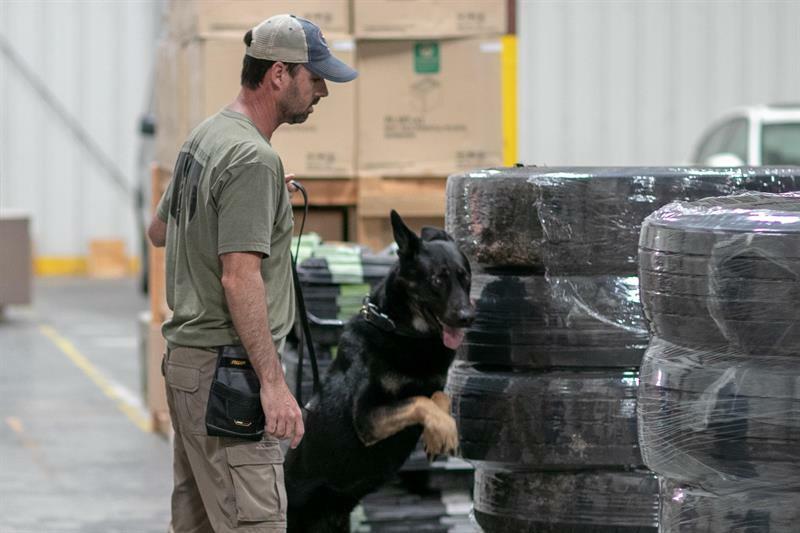 Spectrum Canine, a TSA-endorsed evaluator and supplier of working dogs and handlers, sent a team to CSK9’s Anniston, Alabama, training centre to evaluate its canines’ ability to detect explosives hidden within complex cargo. This facility, with its training and management staff, is one of four hubs that will be used to support CSK9 cargo screening operations across the nation. The is an important step in facilitating the widespread adoption of canine screening, which was previously limited as only the TSA was able to certify canines for use in this application. Sniffer dogs offer a host of advantages to the user: unlike expensive, high-tech screening equipment, they can be deployed anywhere in the world, regardless of airport infrastructure, capacity and financial constraints. The use of dogs is also an affordable solution, with the potential to save hours in freight handling time. Being mobile, dogs can screen the cargo while it is being loaded, instead of it being transported to a fixed screening facility, and the consignments need not be unpalletised to be screened. President of Spectrum Canine, Frank Schembre, commented.“I would say that, after placing the teams through a rigorous assessment, the Cargo Screening K9 Alliance has set the bar high, rising to the occasion of being the first successful teams ever to pass these standards." Another 12 of CSK9's Explosive Detection Canine Teams are reportedly already in training and scheduled to undergo 3PK9-C certification in the coming weeks. These teams will begin screening operations at their designated work sites soon after CSK9 becomes an approved Certified Cargo Screening Facility – Canine regulated entity.